Description: This is an action-rpg simulator game. The player spawns in a procedurally generated dungeon. The goal is to reach and kill the boss Manny the Octalpus. Manny will drop a key which will open the door located in the same room as him in order to move to the next level. On the way, the player will have to avoid or kill any Rabbit Ogres who will drop randomized loot including potions, weapons and armor. The player has a set health and mana. The health will not regenerate, but mana will regenerate very slowly. The player can consume health and mana potions to completely replenish their health and mana bars. As the level increases, the items become powerful, but so do the enemies. -Hold left click on the mouse in the direction you wish the player to move in. The further away the mouse is from the player, the faster the player will move. -Pressing "Q" is bash attack that does heavy damage and consumes mana. -Pressing "W" is a dash attack that leaps the player forward to damage enemies. It also consumes mana. -Pressing "E" is an explosive jump attack that does heavy damage to all enemies within the explosion radius. It consumes a lot of mana. -Clicking right click on the mouse is a cleave attack that hits a wide radius in front of the player. This attack does not use mana. -Pressing "1" uses a health potion to bring the player to full health. -Pressing "2" uses a mana potion to refill the players mana. -Walking over a dropped item will pick up that item. If there is a current weapon or armor, it is replaced by the new one. 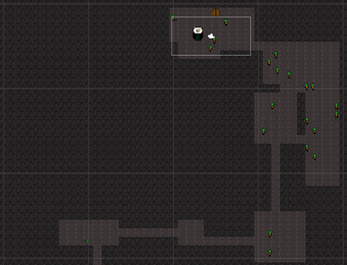 If the item is a potion, it adds to the players stockpile of potions.